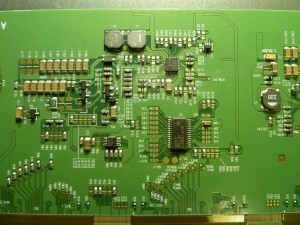 Last week I wandered across a thread over at the Overclock.net forums talking about my iPad controller boards. It would seem there is a growing demand for ultra-high-resolution multi-panel displays amongst the gaming and power user crowd. The recent releases of high-pixel-density panels in consumer devices means they have become quite accessible to the average hobbyist. There are a couple of niches that these panels best fill. For the road warrior, the compact size of the iPad panel might be nice. For the graphic designer, the Macbook Pro Retina panel offers good performance. But for the gamer crowd, where high refresh rate is most desirable, neither of these panels quite fits the bill. As it so happens, boutique PC manufacturer Alienware continues to push the limit (and budget) of the gamer-on-the-go. Enter the Alienware m17x, a megalaptop with an optional 17.3 inch, 120Hz, full HD 1080p, 3D-capable display. That’s an awful lot of display, and found in its native habitat the privilege of using it would start at $2000, but thankfully we can find replacement panels in the usual places for about $100. Now, 1080p doesn’t really hold a candle resolution-wise to some other panels such as the Macbook Pro Retina display at 2880×1800. But the major advancement here is the 120Hz refresh rate, which promises to offer better gaming performance and less video tearing. I don’t game much, but I was curious about the combination of features in this panel, so I bought one to play around with. The panel in all its glory. Note that I’d already removed the square of conductive shielding cloth before this photo was taken, which is why it is wrinkled. 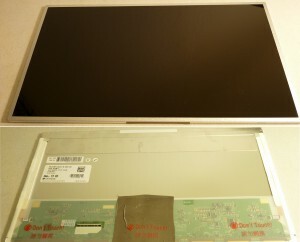 This is the LG LP173WF2(TP)(A1). 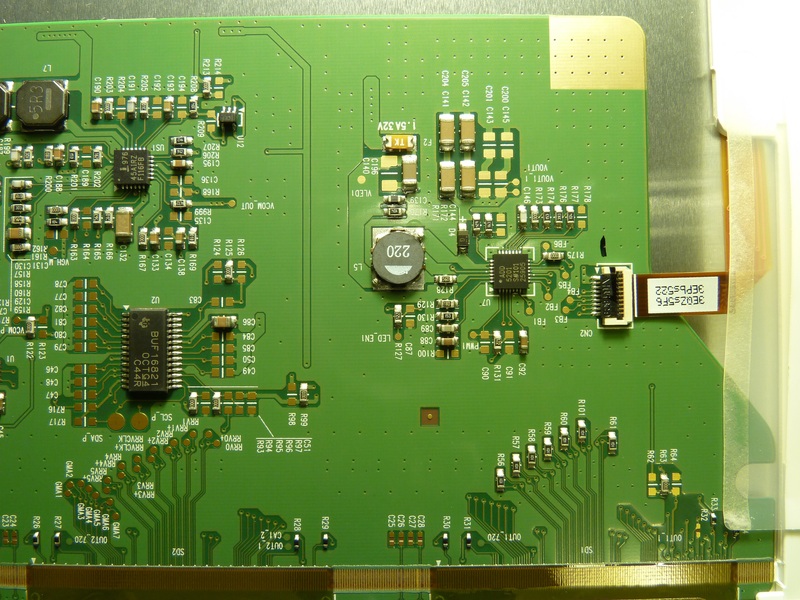 We can pull all the necessary specifications from its datasheet (mirrored locally here). It is driven with 4-lane Embedded DisplayPort, just like the Apple Retina panels. 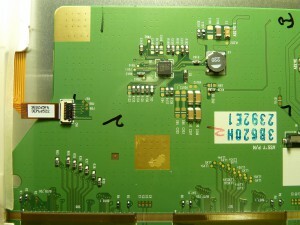 However, interestingly, this panel is driven with 5 volts, instead of the typical 3.3V. Further unexpectedly, the panel electronics draw a shocking 2.3 amps (11.5 watts), which does not include the backlight. I bet the stock 86Whr battery in the m17x doesn’t last very long. Just like every new display, this panel has a different set of power and control requirements to all the others. 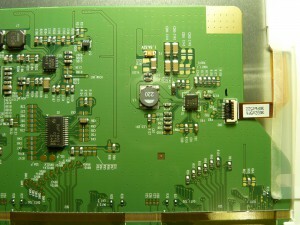 Thus, a new controller board will be designed to fit the particular needs of this unit. But we’ll get to that in due time. First, let’s take a closer look at what we’re working with. 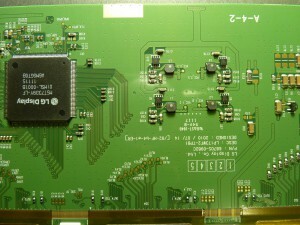 Seemingly similar to every other panel, this one has a unique connector and pinout. In this case it is a JAE FI-VHP series 50-pin connector, FI-VHP50S-A-HF11, mating connector FI-VHP50CL-A. This is a problem for a couple of reasons – first, this appears to be a new part which is not currently available at any of the usual distributors, second, even if we could find it, it’s probably beyond the capability of most folks to populate the 0.5mm pitch connector with the very small (32-42AWG), preferably shielded coaxial wires. So what do we do? We could order a reel of 3000 pieces direct from JAE for some thousands of dollars, but that’s not a wise investment unless we’re likely to use a couple thousand pieces, and then we still need to assemble the harnesses (and soldering 50 tiny wires on 0.50mm pitch won’t be fun). We could draw up a specification and order custom harnesses from a supplier, but still unless the quantities are quite high they will probably be more expensive than we’d like. We could buy used assemblies from the source laptop on eBay, which we can get in single-piece quantities, but these are not very prevalent and are extremely expensive. 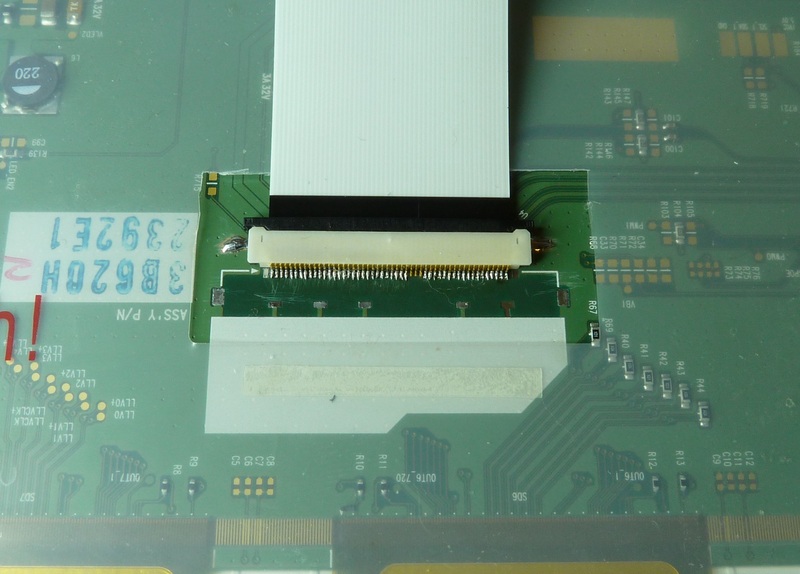 Or we could replace the connector with a more widely-used type, which requires us to modify the panel but is comparatively very inexpensive and easy to come by. I have opted to take this last approach initially, and will reevaluate the other options if demand arises. Originally I contemplated designing a flex circuit harness to solder directly to the panel and break out into an iPad-style 0.3mm contact pattern. I still think this would have been a fairly slick solution, but when I attempted to draw it up I found that this contact pattern is not possible for the low-cost prototype houses to produce – the traces are too small and the pads are too close together. So as a runner-up option I have chosen to replace the existing connector with a 0.5mm ZIF FFC socket, FCI 62684-501100ALF. By using a standard connector like this we can also use standard FFC cable assemblies, which are very inexpensive and come premade in a variety of lengths. I bought a 2-inch cable which seems about right. Original FFC concept, using my full-feature iPad board as a stand-in for the new board.. Ultimately this plan proved too complex for the “budget” flex board suppliers, and I was unwilling to pay for a “real” board house. The downside to this approach is that since the VHP-series connectors have a 3-pin-wide break in the middle, the 50-pin connector is actually the width of 53 pins. Luckily two of the pins on one side are No Connects, but we are still forced to choose between losing pin 1 (“2D/3D Contents Communication”) and pin 48 (DP Lane 3 shield ground). I have opted to offset the connector to carry the ground connection, and will re-wire pin 1 to one of the three unused pins in the middle of the connector if I get around to it. 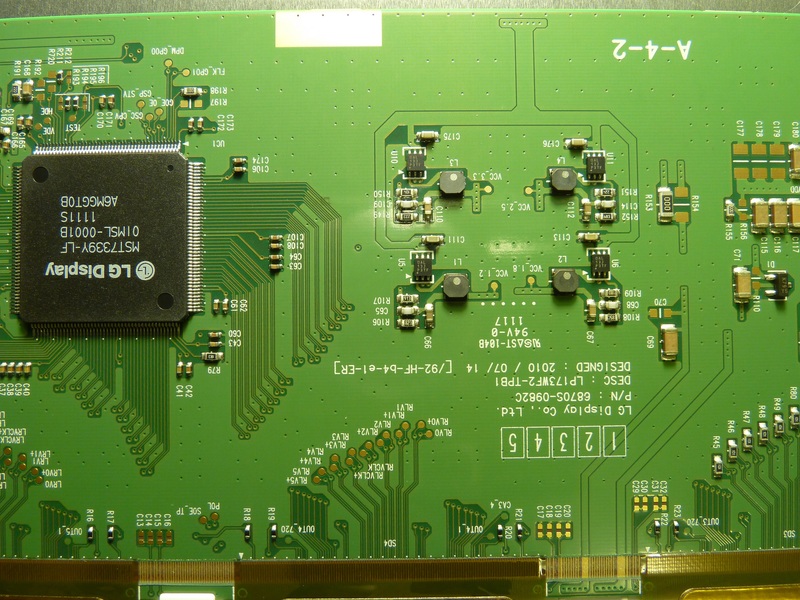 Actually if you look at the controller photos it appears as if pin 1 is connected through a non-populated resistor and is thus a no-connect, so I may not bother. The removal of the existing connector took a surprising amount of effort. 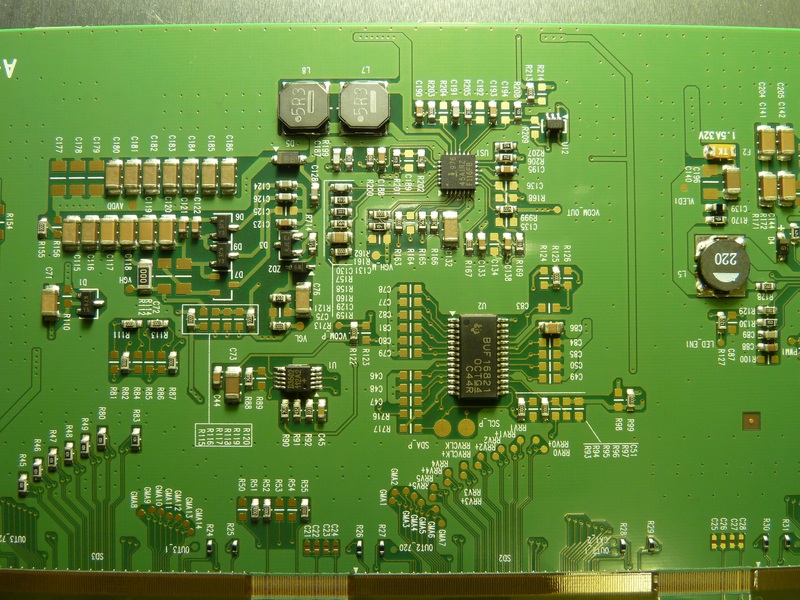 The FI-VHP series has stabilizing legs soldered to the board on the three sides without contacts, so all four sides are soldered down. 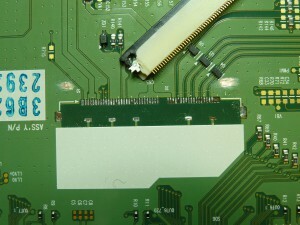 This makes removal of the connector, particularly without harming nearby components, quite difficult. To reduce heat transfer to the heat-sensitive plastic diffuser films, I propped the controller board up off the rear surface of the panel. I would like to have flipped the controller board over and solder it against a flat surface to avoid stressing solder joints, but the board is held by a small jog in the plastic frame and I felt uneasy putting enough stress on the connecting ribbons to move it. Connector removed (but pads not yet cleaned), new connector modified to clear U4, soldermask removed for side feet. Now, to understand my next move, it is important to note my grand plan for this panel. I’ll illustrate the plan with a 3D model as soon as I have time to draw something up, but for now words will have to suffice. 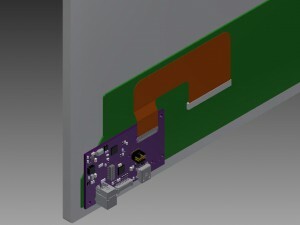 The panel will need to have a controller PCB attached, to generate the backlight dimming signal and break out the eDP to a more accessible connector. The various connectors required and the cables attached to them are bound to be heavy, so I don’t want to attach my board to the thin plastic protective sheet over the LCD controller. I’d much rather stick it directly to the exposed sheet steel chassis. To achieve this the ribbon cable must point up. I could either accomplish this by putting a sharp bend in the ribbon cable, or by populating the connector upside-down. The latter option has the disadvantage of interfering with one of the eDP ESD protection diode arrays, but it provides the benefit of also allowing me to solder down the outer feet to provide strain relief to the tiny solder joints. This is ultimately the path I chose. Looks pretty good, if you don’t look too close. Don’t let the photo size fool you, those pads are really really tiny. Ultimately I was unable to reflow it with hot air and unable to solder it with the finest tip I had on my home soldering iron so I had to take it to work and use the professional soldering station there. 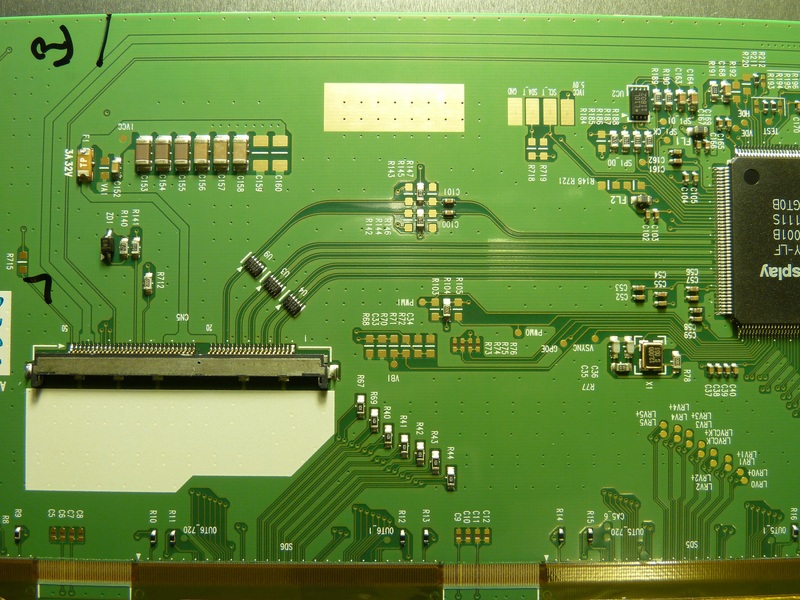 I often say that the things I design are difficult to build up, but for some reason – probably due to the delicateness of this assembly – this one was the most difficult soldering job I’ve recently had to do. I sure hope a source for the correct connector appears, because this was no fun! Actually, to be fair, after I started using the pro soldering station things went a whole lot better, so maybe if you have good equipment it’s doable. But it’s certainly no cakewalk. That’s about all I feel like doing for now. I now need to spend some time hacking the other end of the ribbon into one of my iPad or Macbook boards in order to apply power to the panel. As a happy accident, as I noted in an earlier post, I have a set of boards that I designed erroneously to break out a 0.5mm connector which I thought was used in the Macbook, so maybe I can leverage those to get up and running faster. We’ll see. 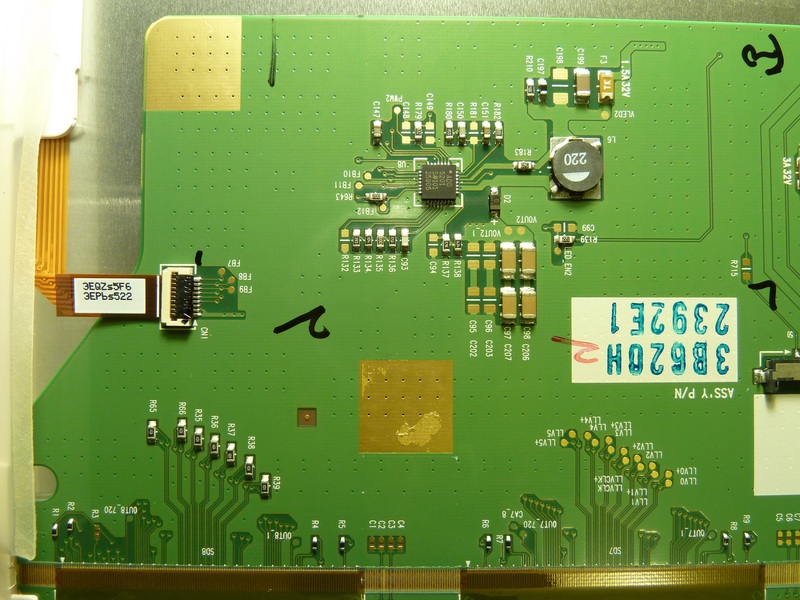 This entry was posted in Electronics on 2013-08-01 by mike. Thank you for looking into this. I am extremely interested. How is the lightboost feature coming? I saw that you referenced a pinout that may have been the lightboost pinout however decided not to use it? I may be mistaken, this technical jargon is just outside of my scope. If I’m understanding you properly, the pinout I referenced was pin 1, “2D/3D Contents Communication”… the manual makes no mention of what this pin is intended for, and the trace terminates in an unpopulated resistor – it looks like it is a feature that was not implemented on this particular model. This has no effect on Lightboost, however. What we need for that is VSYNC – if we know when the panel is about to refresh, we can shut off the backlight so our persistence of vision isn’t disrupted by the transition time (this is of course the core of Lightboost). We have control over the backlight… er, presumably, although in testing I found it slightly slow to respond to change – will need to do more experimentation… and if we tap the VSYNC testpoint (note this isn’t by default broken out in the connector) we might be able to extract the timing. But this is all speculation as after getting the panel running I haven’t done anything else with it. It’s on my to-do list after a few other odds and ends, and I’ll post some more information when I know it. I am sorry that I misunderstood. I assumed the 2D/3D was referencing a necessity for light boost to function as it is a 3D feature that is hacked via the control panel. I am in no rush to build my eyefinity group as I play on a Korean 1440 monitor not to mention I will most certainly need to add a 3rd card to maintain 120fps in upcoming AAA titles. I have however contacted a local hobbyist that has agreed to make an enclosure for the 3 screens so I am ready whenever you are to get the ball rolling. Are you interested in modifying panels as I did, or in a solution utilizing the connector already present on the panel? The former won’t take all that long; the latter, well… we’re a long way off of the hundreds of units I’d need to build in order to get the custom harness made (minimum quantity ~500). I personally could not/wont modify the panels however the hobbyist I spoke of may be able to. How intricate is the process of using the connector already present? It’s not a question of intricacy per se, but a procurement problem. The connector on the panel is apparently relatively new, and no reputable distributor stocks it (here I exclude Alibaba/Aliexpress). 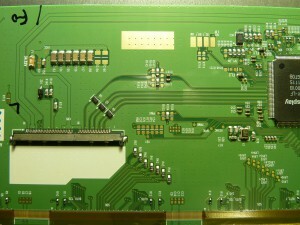 And then even if they did it is difficult and time consuming to correctly build up the 50-pin, very fine-wire harness. I can get harnesses custom built, but in the $20 range each and minimum quantities of 500, it’s not exactly something I want to do on a whim, and at very least not without significant community interest. I went the panel mod route because it cost $7 in quantity 1 and I could get the parts practically overnight (or literally overnight if I’d have paid for it) from a number of distributors. I am not sure if you are familiar with Sager/Clevo laptop’s but I am going to be getting model np9733sm-a which unfortunately at the moment all that is offered is a standard FHD 60hz TN panel, now I know nothing about displays like you do but I am looking to find an effective IPS display or if there isn’t one available that would be sufficient for gaming because of ghosting maybe at least a display that is 120hz, but the thing is I don’t really know where I would start, if you have time could you please take a look here is a link to the vendor who sells this beast http://www.powernotebooks.com/Sager-NP9377-Clevo-P377SM-A-gaming-laptops-notebooks-sys-6208.html just email me if you have time if not I completely understand and thanks so much for your time take care now God Bless! I’m not sure what to make of what is in that thread; they said the correct panel has been identified as LP173WF2-TPB1, but then one of the very last posts shows that the connectors are incompatible. You may need to source a new cable for the panel as well. Ultimately, the members of that forum have more experience than me on this particular topic, so you may want to ask around there. I’ll be happy to answer any other questions you have, but keep in mind, without photos or documentation on this laptop, I’m just as much in the dark as you are! Do you know if there by now is a purchasable 50 pin cable/eDP controller that would work with this screen? Hi, so did this work? was it smooth 120hz or choppy? I see some controller boards that supports 120hz now I shouldn’t need to do any cutting, soldering, etc.